Greater Noida: Today an industry meet was organized under Uttar Pradesh Skill Development Mission at Radisson Blu hotel in Greater Noida. 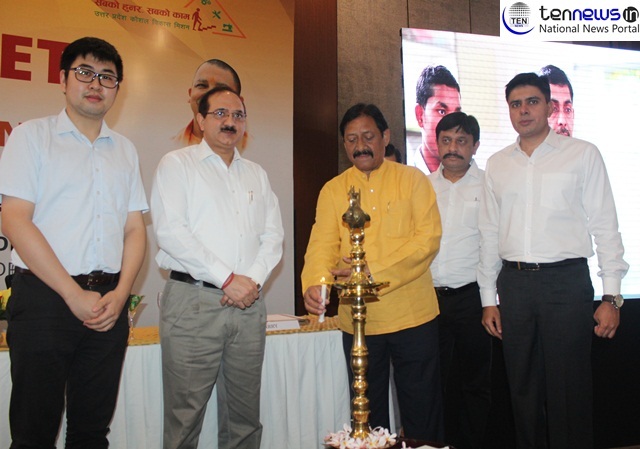 Chetan Chauhan, Minister of Department of Vocational Education and Skill Development was the Chief Guest of the event. Bhuvnesh Kumar, Secretary of Department of Vocational Education and Skill Development and Pranjal Yadav director of UPSDM were also present. Program started with a light lamping ceremony which was followed by a briefing by Pranjal Yadav. He Briefed the Gathering about the mission through a power point presentation and appealed the participants to be part of this mission by signing a flexi Mou. The theme of the mission was Chiselling the skills & Fascinating the future. Beside this a Mou was also signed between Nova and UPSDM. During this meet different businessman shared their experiences of collaborating with UPSDM and said this mission is a great initiative which is providing a platform to both the companies and the youth. We will also try to absorb more and more skilled Man power through UPSCD.